So I’m still having some issues with sleeping properly. Just look at the time! I’m still awake. Wide awake. I’m not sure what I can do, medication doesn’t help. I don’t even think it has anything to do with anything really anymore. Anyways so what have I been keeping myself occupied with? Well I was doing some more research into ::wikipedia(Mutual Funds, Mutual Funds):: to recommend to clients etc. On top of that I’ve been working on a new design for my travel website. 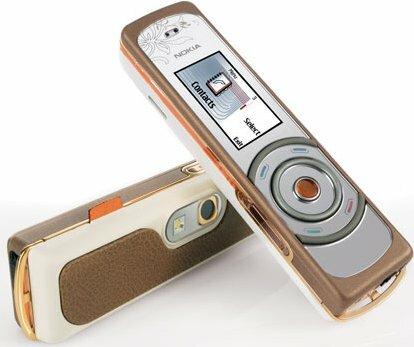 However, check out what I found for cell phones…granted I’m a *little* behind the press release.It’s the L’amour line from Nokia. I guess with the huge success of Motorola’s Razr, Nokia’s upating their phones to be a little more fashionable. They already have that crazy expensive model they sell at Holt Renfrew with worldwide 24/7 concierge service. But that isn’t enough. I’m sure these will have a very hefty price for what you get, simply so you can be hip. Well it’s true, cell phones are now more than ever a fashion accessory. Every news source says that other than your wallet and keys, your cell phone is the only other item you’ll return home immediately for. It’s so true. This is the Nokia 7380. It’s tri-band and where it shines is it’s 2 megapixel camera. It truly is a diva-ish camera for the fashion conscious. A night time phone for a swank dinner or party. Wish it were quad band that certainly helps here in the Americas. The NOkia 7360 is a little less fashionable and looks a lot more like last year’s typical phones. Lower resolution, cheaper camera and less features..which means it’ll probably cost less and there’s gonna be a bunch of teenie-boppers running around with this one. This one is the Nokia 7370, it’s got all the annoying features we’ve come to expect the crazy ringtones, and in this case upping the bar to video ringtones. A FM tuner and a decent 1.3 megapixel camera. This will definitely please the crowd that goes for flip phones. Cell Manners a site for you to gripe about people with no cell phone manners as well as pick up a few etiquette tips.